It’s been a hugely productive week at the easel. Maybe it’s all this early summer sunshine we’re experiencing, maybe it’s the results of good preparation and having absolute defined goals or all of these things combined. Whatever the magic ingredient that has encouraged this week’s artistic endeavours, like Oliver Twist with his little hands on his begging bowl, please, can I have some more? So what have I been up to? Well apart from completing all the finishing touches on a new series of beautiful mini seascapes (coming soon!) and planning some future works, this little piece below, which had been sitting unfinished and unloved for a few weeks, wandered back up on to my easel. I’d began this abstract portrait with fervour. Then, after an intense painting session, kind of felt that I’d done all I could do and resigned it to dry on one of my waiting shelves in my studio. I think because I didn’t fret about how I was going to finish it, or whether it matched my original concept, my subconscious was allowed to work out what to do next in a very natural, organic way. Abstraction can be quite difficult because it can turn into a muddy chaos pretty quickly, especially with oils due to their slower drying times. 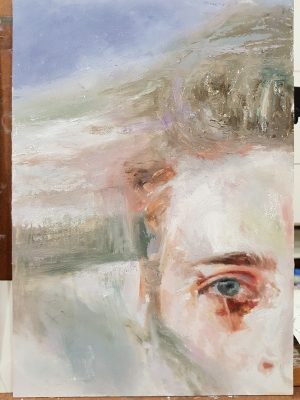 Hopefully, this warmer weather will have speeded up the oils oxidization so today one final, productive painting session will see this abstract portrait complete, ready for its custom-made floating frame.